For the past fifteen years, the PC gaming market has been dominated by one retailer above all others: Steam. An online sales, downloading and gaming service, Steam is run by Valve Corporation and has utterly dominated the market since launch, fending off several competitors along the way. 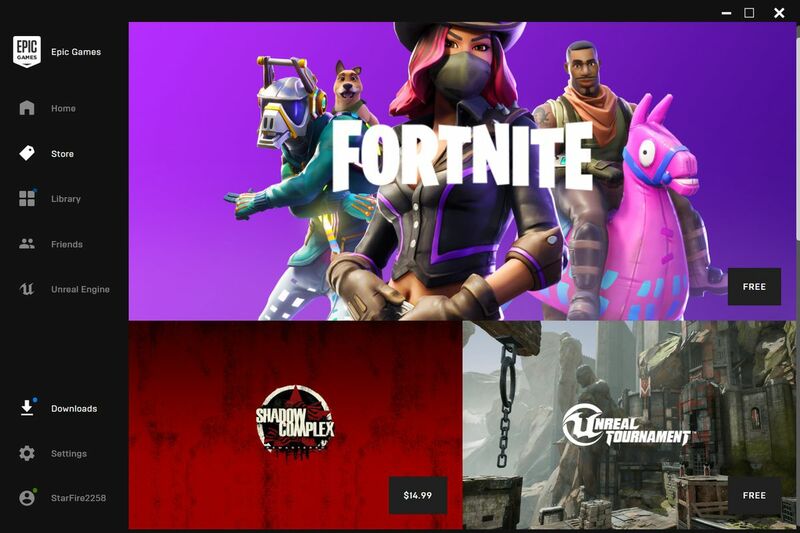 But that has now changed, with Fortnite developers Epic Games launching a rival service that means to do nothing less than smash Valve's monopoly forever. Steam was launched in late 2003 as a system for updating Valve's online games, titles like Counter-Strike, Day of Defeat and Team Fortress Classic, keeping players all in sync with one another and allowing new maps and patches to be rolled out quickly and efficiently. In 2004 the service transitioned to a store, selling new games. It was mostly ignored until the November 2004 release of Half-Life 2, arguably the most eagerly-anticipated video game in history up until that time. It was the sequel to Half-Life, the 1998 game that rewrote the first person shooter rulebook and established Valve as a force to be reckoned with in the PC gaming scene. Half-Life 2 launched with the required use of Steam. You could buy Half-Life 2 in stores, but to install it you had to also install Steam and sign up to the online service. In 2004, when not every gamer was online and certainly most gamers did not expect to have to sign up to an online service to play a single-player-only game (Half-Life 2's multiplayer mode wasn't patched in until months later), this idea was hugely controversial. Gaming communities rebelled, some gamers tried to report Valve for breaches of the law (no such claim was ever upheld) and so on. But Half-Life 2 was anticipated in a manner almost no other game in history was, and the sheer juggernaut force of the game's hype and its overwhelmingly positive critical reception saw gamers swallow their pride and buy the game in their millions. In many cases, they used the service to buy and download the game at midnight on release day, and were playing hours before their friends could get to the shops to pick up their copies. After Half-Life 2 showed that online PC sales were viable, other publishers signed up to the service and more and more games appeared there. Valve had been either lucky or prescient, as 2004 arguably marked the last highwater for PC gaming in the 2000s. The 2005 release of the X-Box 360, followed a few months later by the release of the PlayStation 3, saw a huge crash in PC gaming sales. Within just a couple of years, the number of big titles being developed for PC dropped significantly. 2007-08 was arguably the nadir of PC gaming history, with few big titles coming out, almost no PC exclusives doing well (The Witcher, from CDProjket, being an honourable exception) and the platform being almost dead on its feet. Remarkably, though, Steam had continued to grow in popularity and success. Valve jumped on the rise of indie gaming, adding lots of popular, low-budget titles to the platform. Valve also pushed their big sales hard. They won back support from big publishers through various tactics designed to promote sales. Rockstar Games had released the PC version of Grand Theft Auto IV after a long delay, but noted that although initial sales had not been as high as the console versions, the "long tail" of the game was significant, with sales picking up years later every time the game was put in a sale, making it far more profitable in the long run on the PC platform. By the start of the 2010s the platform had recovered most of its losses, bolstered by the arrival of Kickstarter as a platform for funding niche, mid-tier games. By the end of 2018, Steam had 150 million accounts (30 million more than Netflix) and dominated the PC gaming market with a share of between 18 and 20% (but 75% of the online market). According to some reports, Microsoft has offered over $20 billion to buy the service and the company behind it outright, but Valve's owner, Gabe Newell (who worked for Microsoft in the 1990s, quitting to co-found Valve), had rejected such overtures out of hand. Understandably, other services have tried to compete with Steam. CDProjekt launched GoG (Good Old Games) as a rival service which focuses on getting older games updated to work on modern hardware. Their main selling point is not using an form of DRM (Digital Rights Management), which they feel hinders the customer experience. Meanwhile, Electronic Arts, UbiSoft and Blizzard-Activision launched rival services to exclusively launch their games, respectively Origin, UPlay and BattleNet (although many UPlay games are also available on Steam). With relatively small game catalogues and niche target audiences, these services have existed alongside Steam, rather than trying to compete directly with it. This has now changed thanks to a company whose pedigree in PC gaming is even older than Valve's: Epic Games. Founded in 1991, Epic Games spent the 1990s releasing a large number of low- and mid-budged action games before releasing their first 3D shooter in 1999, Unreal. Unreal was followed by both sequels and the immensely successful multiplayer spinoff series, Unreal Tournament. In 2006 launched a new single-player focused series on console, Gears of War, which was immensely successful. They also made immense amounts of money by licensing their Unreal Engine to other companies and publishers. In 2017 they redeployed the Unreal Engine to make a new, fun and lighthearted co-op shooter called Fortnite: Save the World, and its multiplayer spin-off, Fortnite: Battle Royale. Better known just as Fortnite, the game has become the biggest global success story since Minecraft, with Epic Games making significant profits from the game's downloadable extras and content. Late last year, Epic Games launched the Epic Store, which they proudly proclaimed was going to take the fight directly to Valve. At first gamers chuckled and moved on: many companies had vowed to do the same thing and all had failed. But then Epic Games started doing something that no other would-be Steam-killer had done before: actively seeking out PC gaming developers and offering them staggering sums of money for a 12-month exclusivity period on PC. In addition, Epic Games offered to take only a 12% cut of the sales of games, as opposed to Valve's huge 30%. Developers, watching profit margins drop steadily over the years due to an inability to keep development costs down and also an inability to raise prices accordingly due to market saturation, started signing up enthusiastically. The first casualty was Metro: Exodus. The third game in a popular first-person shooter series, following on from Metro 2033 (2010) and Metro: Last Light (2013), Metro: Exodus's Ukrainian developers were offered a huge sum of money for a 12-month exclusivity period. They agreed. Fans of the series and more casual gamers railed angrily against the development, citing it was bad form for a company to wall off a game behind a new service, especially a new service that did not have the ease of use or many of the most basic features of Steam. They were also suspicious of Tencent, a Chinese company accused of spying on customers, which had acquired a 40% stake in Epic in 2012. Despite these complaints, Metro: Exodus sold exceptionally well on release, outselling Metro: Last Light more than two-and-a-half times on launch day. Last week Epic flexed its muscles by locking in Phoenix Point to an exclusivity period. Phoenix Point is the eagerly-awaited new turn-based tactics game from X-COM creator Julian Gollop and his company Snapshot Games. Using an approach similar to Firaxis's recent XCOM games, the game goes for a more simulated-based approach and has been praised for its gameplay decisions. For a tiny company like Snapshot the deal was apparently "impossible to resist," as the money offered could keep the company going for "years." For fans, the anger was much more palpable this time around and also more readily supported: Phoenix Point had been crowdfunded with the explicit promise that the game would be available on Steam and GoG on release day, and that was now not going to happen. Possibly the most eagerly-awaited PC game of 2019 became reviled overnight, with an absolute flood of refund requests pouring in. But this has not stopped Epic's onslaught. In the last few days they have announced a blizzard of new acquisitions and deals. Obsidian Entertainment's The Outer Worlds, another of the most eagerly-awaited games of 2019, has joined the exclusivity deal (or, more accurately, publisher Take Two signed up for them). Quantic Dream, known for their moody console games with jaw-dropping graphics, were offered a deal so lucrative that they have gone back and dusted down all of their previous games going back to 2010 for release through Epic (comprising Heavy Rain, Beyond Two Souls and Detroit: Become Human). Remedy Entertainment's promising Control has also signed up, along with RTS Industries of Titan and The Sinking City. The full list is extensive and surprising, encompassing many mid-range upcoming PC games, which are the bread and butter of the platform. This is nothing less than a full-scale assault on Valve's control of the PC gaming business. Whether it can be sustained is unclear, but it represents the biggest challenge to Steam's supremacy in over a decade. Valve will have to respond and in some respects it already has, promising to fix long-standing problems like people gaming the review system and offensive zero-budget, zero-effort games being shovelled onto the platform. The real test, I think, will come when a real AAA big-hitter that should be on Steam goes Epic Store exclusive. Take Two putting some games exclusively on Epic has to be a major concern. It's an open industry secret that Take Two and Rockstar Games are prepping a PC version of Red Dead Redemption 2, 2018's biggest game on console, for release likely in 2020. If they decided to make that game an Epic exclusive, it would be a huge and fundamental blow to Steam's position in the marketplace. This battle could determine how PC games are bought, sold and played in the 2020s, so is hugely significant. But it may also be futile, as waiting in the wings is Google's Stadia system, which may offer a completely different, more Netflix-esque approach altogether. How this pans out will be very interesting, and no doubt contentious. In some cases, the devs are losing sales. I was interested in Metro Exodus and Outer Worlds, but no longer. Maybe I'll buy them when they finally hit a service I use, but I feel like that ship has sailed. My level of trust is through the floor. And I'm not the only one who feels like this. I just don't want to use another middleman program, especially not one that's partially owned by Tencent. No offense to anyone, but it feels good to be a console gamer right about now. You have to wonder where all the money is coming from, or not ... Tencent. Respectability via epic games.